Start your evening at Davy's restaurant in Canary Wharf and enjoy a glass of sparkling wine on arrival to get the evening off to a bubbly start! Then enjoy a delicious 3 course meal and half a bottle of wine each. 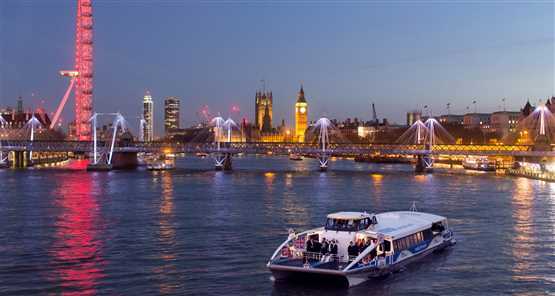 Once you've finished your meal you can make your way to the pier where you will be able to board the Sun Clipper and make your way down the River Thames to see some of Londons most famous landmarks! Enjoy background music as you celebrate the coming of the New Year. As the countdown begins and with a glass of bubbles in hand get ready to toast to 2019 and look on in awe as the famous London Eye fireworks display lights up the sky!